Iraqi President Jalal Talabani has called a series of meetings to discuss the possibility of continued American troop presence in Iraq after the December 31, 2011 deadline for the withdrawal of U.S. forces from the country. The key players at the meeting will be Talabani, Prime Minister Nuri al-Maliki and Foreign Minister Hoshyar al-Zebari. There will be other political leaders in attendance at the meeting - a decision is needed fairly quickly if any American forces are to remain. The meeting is in probable response to calls by U.S. Vice President Joe Biden asking if a request for a continued troop presence was forthcoming. This is an interesting reversal from an Administration that could not remove American forces fast enough. It appears that some of the senior Iraqi and American political leadership recognize that Iraqi military and security forces are not capable of maintaining order in the country. The Iraqi leadership does not want the situation in the country to deteriorate into a new round of sectarian violence, and the Obama Administration does not want to be blamed for squandering the gains made by American forces after the troop surge of 2007-2008. Both Iraqi and American officials concede that the situation in Iraq has worsened over the past year - about the same time when all U.S. combat forces were withdrawn from the country. If there is a request for some American troops to remain, it will likely be framed as a request for “training and assistance” rather than a security presence. That is merely semantics, a fig leaf - the current American forces in the country involved in training and assistance operations are combat capable. Prime Minister Al-Maliki will want a parliamentary decision – that allows him political cover with his Iranian sponsors who want all American forces out of the entire Gulf region, not just Iraq. Al-Maliki is in a delicate position. While his Iranian sponsors are providing weapons and training to sectarian forces responsible for recent American casualties, he will likely have to adopt a position that counters Tehran's wishes. There is another dynamic in play here. 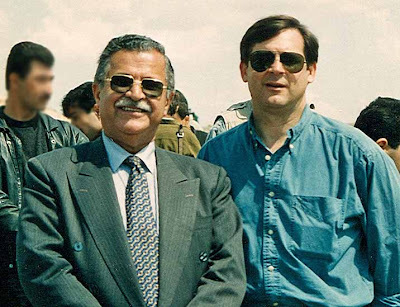 Both President Talabani and Foreign Minister Zebari are Kurds; Talabani was the Secretary General of the Patriotic Union of Kurdistan and Zebari was a senior official of the rival Kurdish Democratic Party. The Kurds, who have established the Kurdish Autonomous Region (KAR) in northern Iraq – the most stable and prosperous section of the country – view the Americans as the ultimate guarantor of their continued security and prosperity and want a continued American presence in the country. The Kurds’ continued security concern is not sectarian violence, but ethnic violence from the Arab majority of Iraq. The Kurds have been at loggerheads with central government in Baghdad since they established the KAR in 2005 in accordance with the new Iraqi constitution. The Kurds have tried to negotiate oil contracts with foreign oil companies to exploit oil fields in the northern part of Iraq, including oil fields near the contested city of Kirkuk that technically are not within the current KAR boundaries. The Kurds are adopting a hard line on the future status of the city. They insist it is part – some call it the capital - of the Kurdish area, while the Iraqi government is concerned about the Arab and Turkoman minorities who also reside in the oil-rich city. Despite the Obama Administration’s political agenda to remove American troops as soon as possible, it appears that some of Obama's advisors at the Pentagon and State Department realize that a continued American presence is desirable on several levels. First, to simply leave an unstable situation - it is unstable and getting worse - is not in the interests of either the United States or Iraq. It might play well for the Iranians, something this Administration has overlooked in the past. Second, as long as the United States has interests in the Persian Gulf region, meaning as long as we are dependent on foreign oil, it will be necessary to have a viable American military presence in the region. Although the U.S. Navy's Fifth Fleet is headquartered in Bahrain, political unrest there may cause that venue to be untenable in the future. There is no country in the Middle East more suitable than Iraq for an American military presence. The country has adequate infrastructure and is centrally located. It allows the United States to almost surround with allies two countries led by regimes of concern: Iran and Syria. Having American troops and combat aircraft in Iraq would provide a credible deterrent to these countries. Of course, that assumes this Administration is willing to review - and reverse - its failed "engagement" policies with Tehran and Damascus. American troops in Iraq after the end of the year? It's a good idea. 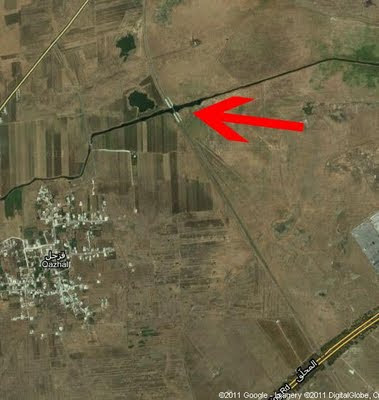 On July 24, unknown persons caused the derailment of a passenger train outside the restless city of Homs, about 100 miles north of Damascus. The city has been the venue for weeks of anti-government demonstrations and ruthless regime repression of those demonstrations. Sixteen passengers were injured in the incident; the train's engineer was killed. Unusually, the Syrian government did not try to portray this as an accident, going out of its way to show reporters bullet holes in the engineer's cabin. The exact location of the derailing is 34º 45' 39"N 36º 38' 02"E, just outside the Ring Road around Homs. 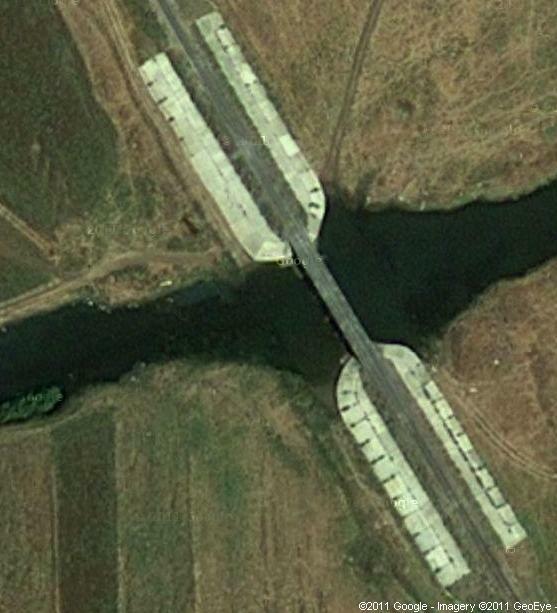 A search of satellite imagery and available news footage enabled me to find the location. It is close to the village of Quzhal, quite a distance from the reported location of al-Sawda. This is not surprising - the Syrians are notorious for not providing accurate locational data. The spot selected for the train derailment smacks of amateur actors. A few rail sections appear to have been removed on the south side of a bridge over a small river. In the absence of using explosives to destroy the bridge, the perpetrators should have removed track sections on the bridge itself or on the north side of the bridge to cause damage to the bridge, possibly rendering it unsafe for future traffic. Tracks are easy to replace; bridges are not. That said, the choice of a passenger train carrying almost 500 people is hardly a viable target for a groups of anti-government protesters - but who else would have done it? It would be impossible to know if the passengers on the train were regime supporters; more likely, many were not happy with the Ba'th regime of President Bashar al-Asad. Had this been a military train, that might be an acceptable target. Given the timing of the derailing, this appears to have been Train 230, the night train from Aleppo to Damascus, hardly a train that would be used for military movements. According to the governor of Homs governorate, Ghasan 'Abd al-'Al, the train derailed between 1:00am and 3:00am. This coincides with the schedule below, showing Train 230 departing Aleppo shortly after midnight and scheduled to stop in Homs at 3:30am. The governor's remarks are confusing, though. 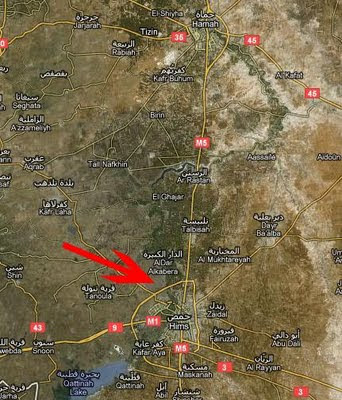 He said (translated), "The saboteurs learned the schedule of the train which passed Aleppo at 1:00 a.m. They dismantled the rails during the two hours before the train was due to arrive at Damascus at 3:00 am." This may be an error in translation; I have not been able to get the audio of the remarks in Arabic to allow me to determine exactly what he said. First, "learning" the train schedule is not rocket science. Even in tightly-controlled Syria, the government has to tell people when the trains operate. Second, the train was scheduled to depart its origin in Aleppo earlier than the 1:00am time cited by 'Abd al-'Al, and the train was not due to reach Damascus until well after 6:00am. This attack was exactly the wrong thing to do. An unprovoked attack on a passenger train that has nothing to do with the Ba'th regime other than the fact that it is part of a state-owned enterprise, is just wrong. it undermines the legitimacy and credibility of the anti-government demonstrators who up until this point have been nonviolent. The violence has been perpetrated by regime forces seeking to repress the demonstrations. This violent attack plays right in to the hands of the regime. It now has a violent act that can be cited to justify further repression of the demonstrations. If there was a chapter on how not to protest successfully in a dictatorship, this would be among the major topics. The leaders of the demonstrators need to denounce this senseless act. 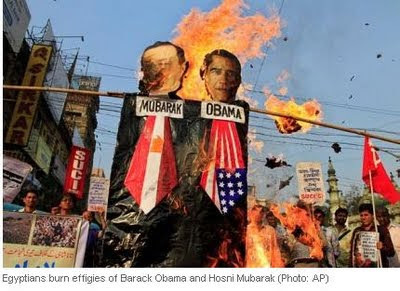 Obama and the Middle East - Worse than Bush? To say that the Middle East policies of the Obama Administration are different than that of the previous administration is an understatement. As we used to say in the Air Force, it's "180 out" from one to the other. I say the "policies of the Obama Administration" rather than attributing the policies to the President himself because I assume he is following the guidance of Secretary of State Hillary Clinton and his other political advisors. If so, he may want to rethink his choices of Cabinet members and advisors should he be re-elected - this current group is not doing so well. One need only look at public opinion polls being conducted where it counts - in the Middle East. Polls conducted here are meaningless to the people who live in the region and are directly affected by the Obama Administration's policies. One such poll was conducted by the firm of IBOPE Zogby International. The primary pollster for this firm is John Zogby, a Lebanese-American with a keen understanding of Middle East events, and a member of the Democratic Party. The bottom line - the United States is less popular now in most Arab countries than during the Bush Administration. This must come as a blow to the Obama Administration, who touted its new "engagement" policies as the way to restore American influence and standing in the region in the aftermath of the invasions of Afghanistan and Iraq. With the exception of favorable views in Saudi Arabia and Lebanon of Obama's decision to support the imposition of a no-fly zone over Libya earlier this year, public opinion in Morocco, Egypt, Lebanon, Jordan, Saudi Arabia, and the United Arab Emirates cites no improvement in U.S. relations in the Arab World since Obama took office in 2009. One alarming statistic is that except in Saudi Arabia, the Islamic Republic of Iran under President Mahmoud Ahmadinejad has higher positive ratings than does the United States under President Barack Obama. President Obama’s attempts to engage Iran and Syria have not resulted in improved relations or improved perceptions of America. In fact, the opposite is true. President Obama is perceived as a weak leader, unwilling to confront the regimes in Tehran and Damascus, and incapable of resolving any regional issues, including the Palestinian issue, an issue on which the President has expended large amounts of real and political capital. This must be frustrating for the residents of the Middle East who hoped the election of President Obama would usher in a new era of American leadership in the region. What we find in the region now are American withdrawals from yet undecided conflicts in Iraq and Afghanistan, an unwillingness by the Administration to put pressure on Syria for its brutal repression of its own people, no plan from Washington for progress on the Palestinian-Israeli issue, and a seeming lack of urgency is addressing the Iranian quest for nuclear weapons. There also seems to be confusion on how to deal with the popular uprisings - the so-called "Arab Spring" - in the region. Please do not hold up Libya as the shining example of successful policy. The United States waited until it was almost too late, led some effective operations, but then abdicated its leadership role and assumed this puzzling "lead from behind" strategy. In my almost three decades of military service, I never was exposed to this "lead from behind" concept. That's because it is ridiculous. Libya should have been over in three weeks. By prolonging the conflict through lack of American leadership, more Libyans have died than were necessary, and the situation is still not resolved. Imposing the no-fly zone was the right thing to do. How this Administration did it was not. All of this is not lost on the Arab world. The perception that the United States is being led by a weak, indecisive President makes the area more dangerous, not less. Mr. President, please listen to the career Middle East specialists at State and Defense, not the political appointees who are harming American interests in the region. They are not serving you well. In the aftermath of the successful May 2011 U.S. special operations forces raid into Pakistan that resulted in the killing of al-Qa'idah leader Usamah bin Ladin, there has been a subtle shift in the traditionally uneasy relationship between the government of Iran and the al-Qa'idah terrorist organization. One of the key leaders of the terror organization is Sayf al-'Adil*, currently under supposed house arrest near Tehran. 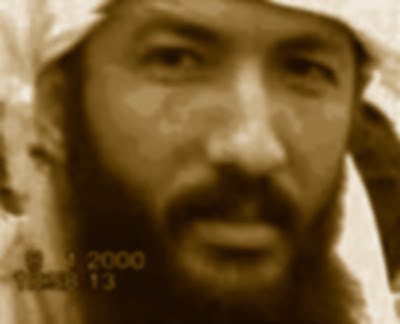 Al-'Adil, like other senior al-Qa'idah leaders and bin Ladin family members, fled to Iran in the face of the American invasion of Afghanistan in 2001. According to the Iranians, they were placed under so-called "house arrest" in a residential facility near Tehran. Despite the restrictions placed on these leaders, al-'Adil has been known to travel to Pakistan and probably Afghanistan. Iran is using al-Qa'idah as a tool in its own fight with the United States and the West. There is no common ideology between the Iranian Islamic Revolution (enqelab-e islami) and the al-Qa'idah Organization (tanzim al-qa'idah) other than the fact that they are both Muslim and favor the imposition of their own interpretation of Shari'ah law. The Iranians follow the doctrine of the Shi'a sect of Islam, while al-Qa'idah is a Sunni fundamentalist group. This relationship is also complicated by the fact that al-Qa'idah is an Arab organization, while the Iranians are predominantly Persians - the animosity between the two runs long and deep. So here we have two diametrically opposed, ethnically-different Islamic fundamentalist groups supposedly cooperating with each other. The differences go further than just ideology or belief system - it involves much bloodshed on both sides and includes attacks on sites holy to the other side. For example, in Iraq in 2006, the group known as "al-Qa'idah in the land of the two rivers" (more commonly called al-Qa'idah in Iraq, or AQI) under the leadership of the late Abu Musa'ib al-Zarqawi masterminded the beginning of a civil war in Iraq, a civil war between Sunni Arabs and Shi'a Arabs. The attack was the proverbial straw that broke the camel's back. Despite exhortations from Tehran and Iraqi Shi'a religious leaders, the Shi'a rose up and responded with violence - just as al-Zarqawi planned it. Al-Zarqawi's stated goal, although not supported by Usamah bin Ladin and al-Qa'idah number two Ayman al-Zawahiri, was to kill all of the Shi'a, whom he viewed as apostates to Islam. The irony - Iran is now cooperating with a group that attempted to kill as many of its fellow Shi'a as it could. Why? The answer is simple. There is one common conviction shared by both al-Qa'idah and the Iranians - hatred of the United States. That hatred of the United States transcends their hatred of each other. It is strong enough to make the two enemies work with each other. Since the Secretary has laid down the gauntlet and told these top leaders that if possible, their fate will be the same as that of Usamah bin Ladin, they may be looking for a safer place to hide than Pakistan. Pakistan's probably-complicit Inter-Service Intelligence Directorate has proven not as efficient as might have been thought prior to the May raid. The chances of the Obama Administration launching a similar raid into Iran is virtually non-existent, given its flawed and failed "engagement" policy toward the Islamic Republic. Iran, for its part, gets to exert greater influence over the al-Qa'idah organization, fitting in with its goal to be the key power broker in the region as the United States all but capitulates its leadership position with the politically-motivated - and premature - withdrawal of its military forces from Iraq and Afghanistan. Note to political science majors and junkies - what the Iranians are doing is classic. They have turned a potential enemy into an ally in the fight against a common, larger threat - the United States. The Iranians live by the Middle East adage, "The enemy of my enemy is my friend. * Sayf al-'Adil is a nom de guerre. It is Arabic for "Sword of Justice." The Iranians are moving to replace the United States as the key power broker in both Iraq and Afghanistan as the Obama Administration withdraws American forces from those two countries. (See my earlier piece, Iran picks up the pieces - again. That is to be expected, especially since the Obama Administration has in essence handed the area to the Iranians. 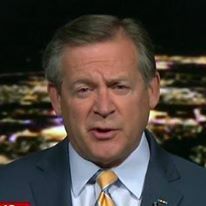 The Iranians have assessed - correctly in my opinion - that the current Administration must please its voting base and withdraw its forces whether or not it makes sense militarily. It is difficult to blame the Iranians, after all, they are acting in their own national interest. However, the Iranians have taken this effort to another level, one for which we can blame them. Not content to wait out the American troop withdrawal and simply ingratiate themselves with the corrupt governments of Nuri al-Maliki in Baghdad and Hamid Karzai in Kabul, the Iranians have upped the ante by providing additional and more effective weapons to the Taliban in Afghanistan and three Shi'a militias in Iraq. These weapons have been tied directly to recent deaths of American troops both countries. In somewhat refreshing declarations, American military leaders in Baghdad and Washington, as well as American ambassador to Iraq James Jeffrey, have unambiguously identified the weaponry as originating in Iran, provided by the Islamic Revolutionary Guard Corps, and tied directly to American casualties. This is a welcome change - in the past two years, no official would acknowledge what we all knew to be true, that Iranian weapons were killing American forces. To admit that would be to cast doubt on the wisdom of the Obama Administration's policy of engagement with Iran. This policy has failed. In fact, it has gone beyond failure and led to a series of Iranian policy successes. One only need look at the status of the Iranian nuclear weapons issue to realize this. If you are still under the impression that Iran is developing a nuclear electrical energy generation capability, you may not care to read further. Iran is developing nuclear weapons - it already has the missiles to deliver them. If they did not have the missiles, the United States would not be seeking an anti-missile capability that specifically addresses Iran's capabilities. 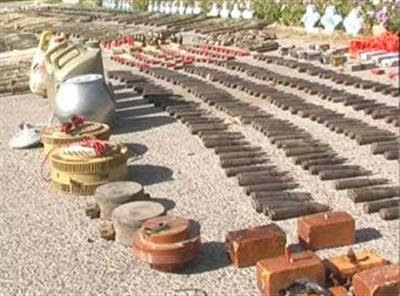 Why has the Iranian leadership decided to provide weapons to the Taliban and Iraqi Shi'a militias, weapons they know will be used against American troops? Why not wait for the American troops to just leave? In the case of Iraq, that withdrawal will be later this year, unless the Iraqis ask for the continued presence of American troops. The Iranians are astute followers of American domestic politics. They know that if they use their surrogates to cause increased American casualties, it will not matter if the Iraqi government asks for troops to remain because American public opinion will not support it. I view an Iraqi request for a continued American troop presence as unlikely as long as al-Maliki is in the pockets of the Iranians. In the case of Afghanistan, the Iranians know that the war is becoming unpopular in the United States. They assess - again correctly in my opinion - that President Obama is making decisions based on politics and not the military situation. As the United States enters the 2012 Presidential election cycle, Obama will be even more prone to view Afghanistan through the political optic versus the military situation. Now we have the failure of the "engagement" policy converging with the fact that President Obama wants to be re-elected. Given the abysmal state of the so-called economic "recovery," the last thing the President needs is continued involvement in two increasingly unpopular wars in which American casualties as perceived as rising. The Iranians are trying to create the impression in Afghanistan and Iraq that they are forcing the Americans out. They may be successful on both counts. Mr. Obama, I am puzzled. One of two conditions exist in your Administration. Either you don't have anyone that knows much about the Middle East, or you are not listening to them. I have to believe it is the latter since I have worked with some of the Middle East specialists at the Pentagon, CIA and State - many are excellent analysts with years of experience. Since you seem to have chosen to ignore their counsel, let me offer you some free advice. First, your engagement policy was misguided - you allowed the Iranians to take the lead on virtually every occasion. While in your mind this makes the United States the stronger, the more respected, the party willing to go the extra mile. That may be, but in the minds of the Iranians and Arabs that comprise the majority of the people in the Middle East, it makes the United States look weak, like we are caving in to their demands. They know you are not going to use military force, so any threat - and that includes your "nothing is off the table" rhetoric - you might make is meaningless. Perception is reality, and you are perceived as weak. Mr. Obama, if you disagree with my analysis, please feel free to point out the diplomatic successes your "engagement" has brought us.